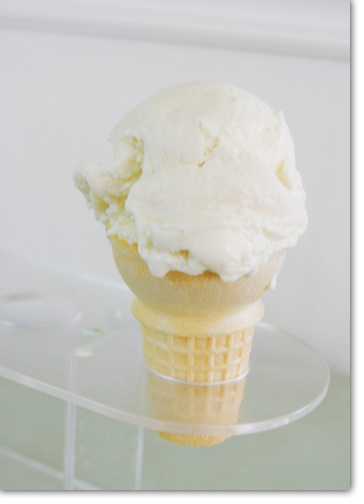 We have 16 flavors of premium ice cream, including some non-dairy and sugar-free choices. Seasonal choices are featured such as pumpkin and peppermint. Our beverages include teas, hot & cold brew coffee & lemonades. Ice cream can be served in your choice of cones, waffle bowl, dish, sundaes, cookie sandwiches & take-home pints. Sundaes are served in dishes or waffle bowls, with chocolate, caramel, and strawberry toppings. Go for "the works" and add whip cream, cherries, and nuts. Ice cream pies are made to special order with your favorite flavor of ice cream in a graham or cookie crust. A 24 hour notice is required for all ice cream pies. We also have Frosty Paw frozen treats for dogs made by Purina. Our outdoor garden is available for birthday parties, meetings, and family get-togethers. Please call for pricing and reservation information.